What Are the Symptoms and Signs of the Plague? How Do Health Care Professionals Diagnose Plague? What Is the Prognosis for the Plague? How Can I Prevent the Plague? Plague is an infectious disease caused by plague bacillus (bacterium), Yersinia pestis. The plague, known as the "Black Death," caused more fear and terror than perhaps any other infectious disease in history. It killed nearly 200 million people during the Middle Ages and has produced monumental social changes, such as marking the end of the Dark Ages and causing the advancement of clinical research in medicine. Although still debated by historians, the plague has been responsible for multiple epidemics and at least three great pandemics (epidemics that are spread over a large region or multiple sections of the world). The first plague pandemic spanned from the Middle East to the Mediterranean basin during the fifth and sixth centuries, killing about half the population of those areas. The second pandemic struck Europe between the eighth and 14th centuries, destroying nearly 40% of Europe's population. Alexandre Yersin isolated the bacterium (germ) that causes plague, developed a treatment (an antiserum) to combat the disease, and was the first to suggest that fleas and rats may have been spreading plague during the epidemic of 1894. The plague bacillus (bacterium) was named Yersinia pestis in Yersin's memory. Pandemics have succeeded in spreading the plague to every major continent, with the possible exception of Australia. Unlike smallpox, the plague cannot be wiped out. It lives in millions of animals and on billions of the fleas that live on those animals. The plague is a disease of the desert, the steppes, the mountains, and the forest. In the U.S., about seven cases per year have been reported during the last few decades. These cases are the mildest form of the illness, and they occur mostly in the Southwest. Prairie dogs and squirrels are vulnerable to contracting the plague in some western states, such as New Mexico, Arizona, Colorado, Utah, and California. The World Health Organization reported 3,248 cases of plague worldwide, including 584 deaths. The number of actual cases is probably much higher because many countries fail to diagnose and report the plague. The following countries have reported the most cases of humans infected with the plague since 1979 (in order of most reported cases): Tanzania, Vietnam, Zaire, Peru, Madagascar, Burma, Brazil, Uganda, China, and the U.S. The three countries with recent outbreaks of the plague are the Democratic Republic of the Congo, Madagascar, and Peru. Madagascar has been experiencing an outbreak of plague. From August to October 2017 there have been 1,801 human cases and 127 deaths. More recently there has been a concern that forms of the plague could be used as biological weapons in a bioterrorism attack. The bacterium (Yersinia pestis) that cause plague can be transmitted from a host such as a rat to a human through the bite of an animal or insect (such as a flea). These bites transport the zoonotic disease. The animal or insect that spreads the disease is referred to as a vector. More than 200 different rodents and other species can serve as hosts. Hosts can include domestic cats and dogs, squirrels, chipmunks, marmots, deer mice, rabbits, hares, rock squirrels, camels, sheep, and other animals. The vector is usually the rat flea. Thirty different flea species have been identified as vectors of the plague. Other vectors of plague include ticks and human lice. Transmission can also occur when someone inhales plague-infected organisms that have been released into the air. Plague can be aerosolized, as in acts of terrorism, causing the inhalation (pneumonic) form of the disease. People infected with pneumonic plague can also transmit airborne plague through coughed droplets of their own respiratory fluid. Close contact with plague-infected tissue or fluid can also transmit plague-causing bacteria to humans. Bubonic plague: The bacteria that cause plague can thrive and grow in the flea's esophagus. This crowding of bacterial growth prevents food from entering the flea's stomach. To overcome starvation, the flea begins a blood-sucking rampage. Struggling to swallow, the flea vomits the plague-causing bacteria into the victim's skin during a bite. The germs invade nearby lymph glands in the bitten animal and produce an inflamed lymph node called a bubo. The plague spreads along the lymph system to every organ. In rare cases, plague spreads to the covering of the brain. Severe illness follows. Bubonic plague has a 13% death rate in treated cases and a 50%-60% death rate if left untreated. Bubonic plague is the most common form of plague. Pneumonic plague: Direct inhalation of the plague-causing germs results in pneumonic plague. Severe illness follows. The death rate for the pneumonic form of plague is 100% if not treated within the first 24 hours of infection. Plague bacteria may be released into the air as a weapon of biological warfare or terrorism causing this type of the disease, or plague may be transmitted person to person through the inhalation of droplets coughed from the lungs of a person with pneumonic plague. Transmission through direct contact is rare. Septicemic plague: This form of serious disease may occur quickly and causes severe blood infection throughout the body (primary). It is difficult to diagnose early because there are no buboes or lung abnormalities. 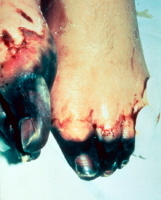 This type of plague can also develop from one of the other types of plague (secondary). Septicemic plague has a 40% death rate in treated cases and about 100% in untreated cases. Risk factors: The following conditions may increase the likelihood of a person contracting a plague infection. Travel: Anyone who has traveled recently in the southwestern and Pacific Coast regions of the U.S., particularly in New Mexico, Arizona, California, and Utah, might have had a flea bite. Although contracting plague while visiting another country is rare, doctors may suspect that a flea might have bitten a patient with plague-like symptoms who have recently traveled abroad to areas where plague is present. Animal contact: Close contact with infected animals and travel through rural areas are risk factors for contracting plague. Historically, rats have been the principal hosts of the plague. Currently in the U.S., ground and rock squirrels are the most common hosts. In recent years, the domestic cat has emerged as a prominent host of fleas that transmit the plague to veterinarians. Bubo: This is an enlarged, tender, swollen lymph gland most commonly found in the groin, under the arms, or on the neck, depending on the locations of the flea bite. Skin: Bleeding into the tissues can turn tissue black. The medieval name black death is thought to have originated from the deeply darkened skin, bleeding, vomiting blood, and tissue death associated with septicemic and pneumonic plague. The initially rose-colored lesions most likely inspired the child's nursery rhyme "Ring Around the Rosy." In making the diagnosis, a doctor performs certain blood tests such as cultures (growing the bacteria in the lab from samples of blood, sputum, and fluid from the bubo). Cultures require more than 48 hours to produce definitive results. A doctor may order an X-ray film of the chest, especially to see if plague has infected the lungs. If plague infection is discovered or suspected, an infectious disease specialist should be contacted for assistance. The Center for Disease Control and Prevention (CDC) may test samples with more sophisticated procedures. Typically, the CDC and the local Department of Health officials attempt to identify the source of the plague and begin procedures for preventing a potential plague epidemic. If doctors suspect a patient may have plague, healthcare professionals will take precautions when dealing with the patient and will wear goggles, gloves, gowns, and masks. Patients are isolated and precautions taken not to infect others. Some patients may need help breathing and are given oxygen. They are kept away from others for two to three days after antibiotic treatment has started or until the infection is cleared. Most patients experience some degree of septic shock (low blood pressure), and specialists monitor this closely in an intensive care unit. Medical management of plague can involve a number of medications. Antibiotics must be given early in the infection to maximize the chance of the antibiotics killing Y. pestis bacteria. These antibiotics might include streptomycin sulfate in combination with tetracycline and other antibiotics. Well or asymptomatic contacts of people with the plague are followed up closely and may be given prophylactic antibiotics as a precaution against disease development. Patients with plague may develop meningitis (infection and swelling of the brain), septic shock (dangerously low blood pressure with decreased function of the kidneys, brain, or other organs due to a serious system-wide blood infection), tissue death and bleeding, and swelling around the heart. All may lead to death. The death rate is about 13% for those treated for bubonic plague. A person with primary or secondary septicemic plague (infection in the bloodstream with associated shock symptoms) has an approximate 40% death rate, even when treated. Pneumonic plague has about a 100% death rate if not treated within the first 24 hours. A previously used plague vaccine is no longer manufactured and not commercially available. It was only effective against the bubonic form of the illness. A small amount of vaccine is obtainable from the U.S. government under special conditions (for example, plague bacteria researchers). In general, to prevent contracting plague, people should avoid contact with wild animals. Controlling rat and flea populations where plague is found is also important. Avoid travel to areas where there is an outbreak of plague. Anyone who has had contact with a plague-infected patient (including hospital and rescue personnel) should be watched carefully for symptoms. At the first sign of illness (such as fever or swollen glands), doctors will begin antibiotic treatment. Pets and people who have come into contact with a plague-infected person may be given antibiotics under some circumstances as a preventive measure. A hungry flea filled with plague bacteria. Courtesy of U.S. Army Environmental Hygiene Agency. A bubo. A tender, swollen lymph node in the groin area of a plague victim. The bubo forms generally in the region of the body where the infected flea has bitten the victim. Courtesy of Jack Poland, PhD, CDC, Fort Collins, Colo.
Rock squirrel coughing the blood-streaked sputum of pneumonic plague. Courtesy of Ken Gage, PhD, CDC, Fort Collins, Colo. The "black death." A victim recovering from bubonic plague. At one time this person's entire body was black. Reprinted from McGovern TW, Friedlander AM. Plague. In: Sidell FR, Takafuji ET, Franz DR, eds. Medical Aspects of Chemical and Biological Warfare. Chapter 23 in: Zajtchuk R, Bellamy RF, eds. Textbook of Military, Medicine. Washington, DC: U.S. Department of the Army, Office of the Surgeon General, and Borden Institute; 1997: 493. The same plague victim as previous photo. The toes have gangrene and will probably need to be amputated. In the United States, most victims with human plague have the bubonic form. If the organisms were used as a biological warfare agent, it most likely would be spread through the air and inhaled by victims. The result would be primary pneumonic plague (epidemic pneumonia). Center for Biosecurity of UPMC. "Yersinia pestis (Plague)." Oct. 19,2011. <http://www.upmc-biosecurity.org/website/our_work/biological-threats-and-epidemics/fact_sheets/plague.html>. Switzerland. World Health Organization. "Plague." October 2017. <http://www.who.int/mediacentre/factsheets/fs267/en/>. Switzerland. World Health Organization. "Plague -- Madagascar." Nov. 2, 2017. <http://www.who.int/csr/don/02-november-2017-plague-madagascar/en/>. United States. Centers for Disease Control and Prevention. "Plague: Frequently Asked Questions." Sept. 14, 2015. <https://www.cdc.gov/plague/faq/index.html>. United States. Centers for Disease Control and Prevention. "Plague." Oct. 23, 2017. <http://www.cdc.gov/plague/>. What prevention measures do you use to avoid getting plague?